↑ "महात्मा उपाधिप्राप्तिः". Retrieved 8 फ़ेब्रुवरि 2014. Riggenbach, Jeff (2 February 2011). "Does Gandhi Deserve a Place in the Libertarian Tradition?". Mises Daily (Ludwig von Mises Institute). 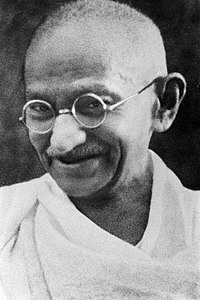 https://mises.org/daily/5002/Does-Gandhi-Deserve-a-Place-in-the-Libertarian-Tradition.